My wifes car (190E) has started to 'surge' when coming to a stop and while still in gear(automatic). The revs increase slightly ( as if accelaerating) for a second or so and then return to normal idle and this is repeated until take off again. This does not happen if shifted into park mode.?? Any suggestions please. I would suspect a worn airflow meter potentiomenter. Airflow demand will be higher in drive, and the pot will be wiping a different part of the element than in park or neutral. This spot it's likely worn thru. Thank you for your comments....I have never heard about or come across this part you mention. Is it something a novice could replace or a shop R&R ? Do a search here for 'airflow meter potentiometer' or 'airflow meter pot'. Lots of pics and info. The part is not separately available from Mercedes, but as a Bosch part from various part houses. Thanks again.....will check it out. If its the part I'm thinking of its an oblong black box on the front of the airflow sensor/throtle body, its got a plug running from the front. I've read that the sensor can be cleaned if very careful. Thanks again, all I have to do now is find where the air flow throttle body is? Could that be under the air filter? Remove the air filter housing....idle control valve is shiny aluminum dohicky just forward of the air flow meter...has two hoses to it and a two pin connector.... They get hard and crack. The hoses, that is ! Put you finger on the air flap very gently, whilst engine is idling ....try to stop it from moving...see if surge goes away....if so this indicates a slow O2 sensor swing....I use a magnet on the center bolt to hold the air plate up against my fingers..
Have also seen air meter lower bellows split too...as well as other misplaced air hoses. At the rear of air flow meter you'll see the throttle linkage...it should rest against a idle switch....small roller on an arm....make sure it does and it should click when opened or closed.....need engine off to hear that click though. Yes, but it is called the airflow meter by Mercedes. Note that the throttle body is a separate part located below. 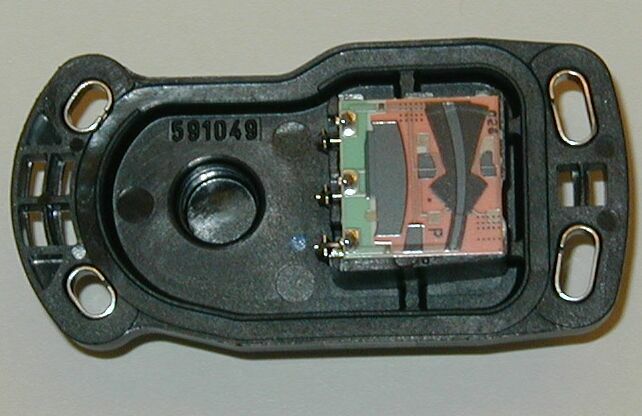 The pot is barely visible from this topside view, but easily so in the upside-down view, on the side, as a black plastic object with three electrical pins. 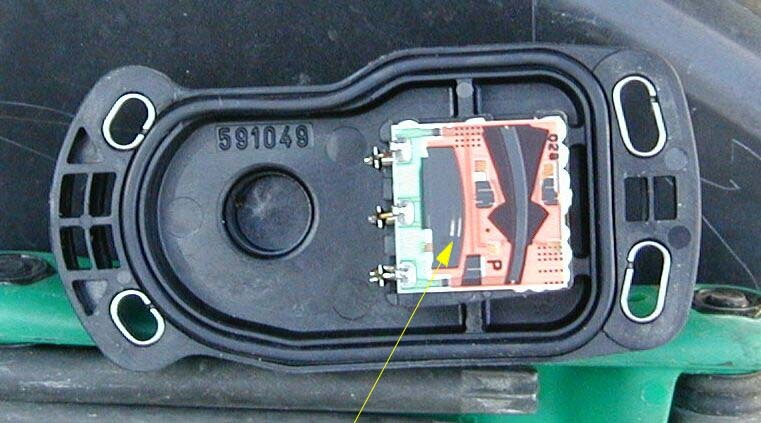 This part can be removed after carefully scribing its position on the airflow meter body. It really cannot be cleaned. I would order a new part if the element is worn out. I have the same problem on my 190E 16V. It could be as simple as a worn motor mount, or a vacuum leak on the throttle area. Sbourg,.....if the part is worn out.....what will it look like? Sorry Steve, but they look vertually identical to me? what am I not observing? Please bear with me, thanks. Ok, here is a repost of the 'old' unit, with the yellow arrow pointing to the spot where the wiper has worn thru the resistance element. What you see is the white streaks of the underlying ceramic substrate showing through. Compare this to the looks of the 'new' one, as posted previously. Note that the wiper is attached to the airflow meter pivot shaft, and stays with the meter when the pot is removed. thanks again for your patience.....now know what to look for. Cheers!